I haven't lately read that many books on Agile and software development, since I have felt that I learn more about software development reading about other subject than software development. Also some of the books have been quite boring, but I wanted give Craig Larmans and Bas Voddes book a change based on good reviews I had seen. Too often books about Agile or Lean say mainly the same things that all other books are saying. 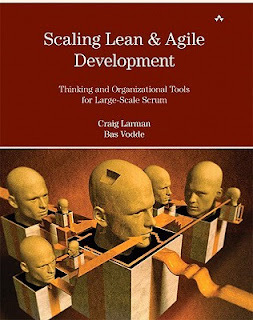 Scaling Lean & Agile Development was a fresh exception. Although it did explain many of the basic things, but it did those with easy and compact form, so it wasn't disturbing. Book goes thoroughly through many different aspects of Agile development in larger scale. It does concentrate on Scrum in it's name, but it does look the things from really from organizational perspective. It doesn't only look from certain layers, but it tries to cover many different aspect. It actually tells about the agile transformation and thinking tools also to get into scaled agile development. It is easy and fun to read, but it does require background knowledge of agile development, scrum and lean to get most benefits from it. So it isn't the first book to read about agile, but somehow I feel it never is the first book. I enjoyed it a lot and highly recommend it to anyone who are in organization which have more than one development team doing software development.